Monkeys With Typewriters started out as my personal blog, but over the months it has somehow evolved into a delicious disaster of boardgame coverage. Over time, I found that I had a lot more people reading for my gaming-related posts than my personal musings. I've decided that it's time to spin off the gaming content onto its own site so I can give those topics the attention they deserve. Therefore, I am happy to announce the launch of MeepleTown, a new site for boardgame reviews, editorials, event recaps, and more! If you've been following this blog for a while, you may notice occasional "classic" (okay, old) articles re-posted on the new site. The goal is to bring fresh, new updates on a regular basis, but until I have a few more contributors, I'm going to use existing content to fill gaps. Which brings me to my other plea: I need more contributors! If you're a gamer and are interesting in writing articles (occasionally or as a regular column), I'd be happy to consider your submissions for MeepleTown. I can't pay anything (hey, this is costing me money! ), but if you're passionate about games and like to write, it's a good forum for your thoughts on the hobby. Toss me a message on Twitter (username WhiteHowler) or send me an E-mail and let me know what you'd be interested in working on for the site. I'm excited to be a part of this new project and hope you'll all come along for the ride. A group of my fellow gaming friends and I have decided to embark on an epic multi-session campaign of Arkham Horror, each week facing a new Ancient One and drawing one step closer to a final showdown with Cthulhu. We started by using only the Dunwich Horror expansion, along with the character and item cards from all sets, and the Personal Story cards. As the campaign draws on, we'll be adding the small-box sets and alternating out the different big-box expansion boards. Eventually we'll have all rules from every expansion in play, and for the battle against Cthulhu we may actually use all four game boards. We've instituted some house rules to make the campaign (hopefully) flow more smoothly. - Seven random Ancient Ones are selected and placed in order of difficulty from easiest to hardest. Cthulhu will take the eighth and final spot. Each week we'll play a game against the next successive Ancient One. - Investigators that are Devoured before the Ancient One awakens are gone forever. History. Toast. Grab another one and start over. - Investigators lost (even "Devoured") in the final battle are considered to be knocked out or temporarily insane. They'll be available for the next session. - Investigators gain one Skill card, which will carry over to the next game (along with all previously-collected Skills). - Investigators reset all money, spells, and items to their initial starting values. However, Investigators may keep items and spells collected in a previous session rather than a random starting item. (For example, if my character starts with a random Common Item, and I collected a Carbine Rifle this game, I may choose to bring that in as my "random" Common Item for the next game). All extra items and spells over the starting values are lost. - Investigators may trade items or spells freely between games (again, remembering that you're limited by your initial starting possessions). - Investigators keep all memberships, titles, and rail passes. Discard bank loans, retainers, blessings, and curses. - Investigators may discard all but one Injury or Madness card. If the player only has one of these cards, it may be discarded. All Corruption cards are discarded as well. - Personal Stories "reset" each game. - If the party won its first attempt at a given Ancient One, the next game will begin with a Herald in play. Ouch. - The obligatory "it was all a dream" clause. Five unused investigators are discarded from the available pool, and the players will face the same Ancient One for the next session. - The next battle with the same Ancient One will have a Guardian in play. - If the investigator pool runs out and we lose a game, the campaign is over. We decided that we'll probably play out the final session against Cthulhu just for fun, and call it a draw if we win. My plan is to post a quick recap after each game. I'm not yet sure how often we'll be able to play, so this may stretch out for a while. We're all excited to be embarking on the campaign and hope you'll follow our triumphs (and grisly deaths) as we attempt to save Arkham from the Elder God menace once and for all! I also had the opportunity to playtest two unpublished prototypes created by Richard Launius, designer of Arkham Horror. I won't go into too many details, but one was a thrilling cooperative sci-fi themed survival game, while the other was a frantic dungeon escape where players tried to one-up each other without getting the entire group killed. Richard loves giving players unique, well-defined characters and tons of dice to roll, and these prototypes were no exception. Both were a lot of fun (though the co-op game was decidedly more polished), and I hope to see them in a game store soon. Oh, and I did mention my acquisition at the AGF flea market, right? 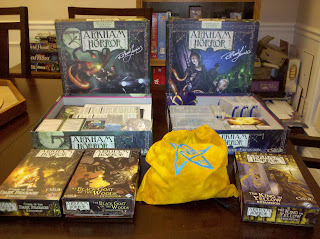 It's a complete Arkham Horror set, including all six expansions. Not only is the entirety of the Arkham Horror universe included, but the set is pimped-out with custom dice bags, plastic containers for all of the counters, nice printed tuckboxes for all of the cards, and extra printouts of player aids and "cheat sheets". And naturally, since Richard Launius was present at the event, I just had to get him to sign it, right? And at long last, I think it's finally time to conclude my coverage of Atlanta Game Fest 16. The event was a success in every conceivable way. I had the opportunity to try tons of new games, and more importantly, I made several new friends. I'm sure AGF will stand as one of the highlights of 2010 for me, and I can't wait for the next one! Welcome to the second installment of mini-reviews for new games I tried out at Atlanta Game Fest 16. Note that I only managed to get in one play for most of these, so it's quite possible that my early impressions were wildly off. That's it for now! I have one more Atlanta Game Fest wrap-up entry to come, in which I'll give give my initial impressions of Hansa Teutonica, Macao, and Forbidden Island. I'll also give my final thoughts on the overall event (and probably take the opportunity to shamelessly boast about the awesome purchase I made at the AGF flea market). Stay tuned! I just returned from Atlanta Game Fest, so it seems like the perfect time to resume blog updates. The event consisted of four days of wall-to-wall boardgaming with far too little sleep in-between. Over the course of the weekend, I played a quantity of games that can only be properly described as "a crapload". In the coming days I'm going to post a few sets of capsule reviews of the new games I tried. It's difficult to form a solid opinion from only one or two plays of a game, but I'll give it my best shot. That's all for now! In the next installment I'll cover The Golden City, Cyclades, Samarkand, Medici, and Summoner Wars. 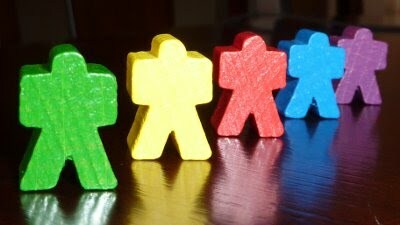 In recent years, a clear distinction has formed between two different styles of boardgame. Eurogames tend to be characterized as "design-heavy, theme-light". You'll find elegant designs requiring few rules. 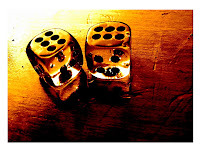 Luck (and dice) are a rarity in most cases, requiring players to win solely through strategy and smart play. 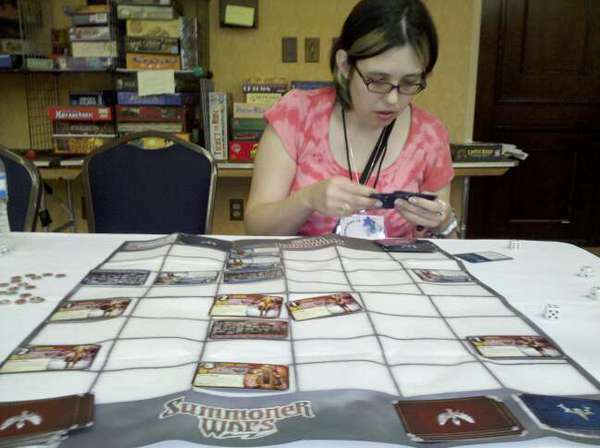 Player interaction is often light or nonexistent, and the most opposition players have to contend with is being blocked out of an auction or a space on the game board. The theme often feels tacked on, and a Eurogame set in medieval times would usually work just as well with a prehistoric or science-fiction setting. The other category is widely known as "Ameritrash". It seems to be a derogatory term at first glance, but fans of this genre have embraced the title as their own. Ameritrash games tend to be theme-heavy, with a lot of direct conflict and tons of dice to roll. Game mechanics are tied closely with the theme; Space Hulk or Last Night on Earth would have to be completely redesigned if the setting were shifted to a stone-age village or a 17th century sailing ship. Many Ameritrash games have a "last man standing" winning condition, in which players are gradually eliminated until only the winner remains. While I enjoy a wide variety of games, I tend to gravitate toward titles with a more Euro-style design. I like to experience some measure of player interaction, but I find constant direct opposition to be either stressful or monotonous. I don't enjoy seeing a string of bad luck ruin a well-laid strategy (even an opponent's). And I feel that player elimination is the worst design element in the entire boardgaming universe; the penalty for doing poorly should never include not being allowed to play. However, I absolutely love games with a strong theme. Caylus and Power Grid, while being quite strong from a design standpoint, often fail to grab my attention. I enjoy the mechanics, so I don't usually shy away from playing these, but I don't find anything particularly engaging about either of them. They're just too bland and dry. 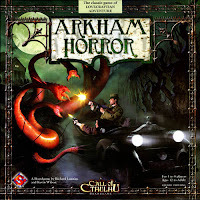 A lot of my love for games like Arkham Horror and Talisman originates with the art style and solid theme. Unfortunately, there seems to be a common misconception that Euro-style concepts and a strong theme are mutually exclusive. Vlaada Chvatil's designs really stand out for me in this regard. They generally play more like "pure" Eurogames*, but the setting is inseparable from the gameplay. Galaxy Trucker simply wouldn't work outside the frantic space-junker universe, and I find Dungeon Lords to be an almost perfect balance of heavy theme, highly-stylized art, and well-integrated play mechanics. I'd love to see more game designers explore this concept, because I think both Eurogames and Ameritrash can bring can bring something wonderful to the table. * Except Space Alert. That one's impossible to categorize. It transcends mere labels and becomes something unique and beautiful. And terrifying. I finally had a chance to play Shadows Over Camelot for the first time last night. The rules were explained, and then the Role and Loyalty cards were dealt out. Aha! I am Sir Palamedes... the traitor. Wonderful, how am I going to pull this off having never played before? I decided to play completely straight, sacrificing cards and life points several times in order to help the cause. The only slightly shady thing I did was place siege engines whenever possible. Our first few turns resulted in an extremely poor position on the Excalibur board, so not wanting to play a black card didn't look too suspicious. I was lucky enough have a hand completely full of Fight cards, which I showed off with an almost solo victory over the Saxons. We finished off the Grail quest, and things were looking good for the heroes. I volunteered to start destroying siege engines while the other players attempted to complete more quests. Suddenly, we had a string of misfortune, and we found ourselves at ten siege engines (twelve is an immediate loss for the good guys) as the player before me started his turn. Knowing that many of the black cards could result in more siege engines, he considered paying one of his two remaining life points to avoid the risk. He asked if I could get an automatic win against a siege engine during my turn. "I can handle it," I answered enthusiastically. A Grail card came up, adding an eleventh siege engine to the board. The other player used his turn discarding to try to save the Lancelot's Armor quest, which was starting to look bleak. Barely able to contain my evil grin, I placed the twelfth siege engine on the board, ending the game. There were several seconds of stunned silence before I turned over my Loyalty card. Nobody had ever suspected me! 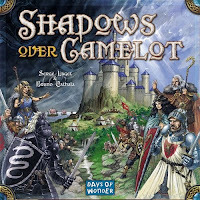 My first foray into Shadows Over Camelot was an absolute blast, and I'd definitely play again. I've heard that the game can easily turn into a micromanagement nightmare, where one or two players give extremely specific orders, and anyone who doesn't follow them to the letter is obviously the traitor. I hope it never comes to this -- I like the idea of coordinating strategy a bit, but it should probably be limited to vague suggestions ("Camelot is in trouble, but we're also at risk of losing the Grail"). 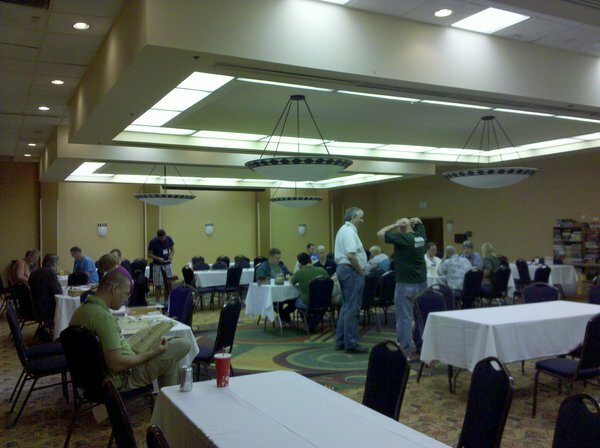 Over the weekend some friends and I drove down to Auburn University to participate in the Auburn Puzzle Party, a semiannual team-based puzzle-solving event. Because some of the puzzle elements required knowledge of area landmarks, we merged with an existing group of Auburn locals to form an eight-person team. Our team, one of six competing in the event, established "base camp" in an off-campus Burger King (this would come back to haunt us later) and met over at the party organizer's house for the introduction. After reading a comic posted on the door of the house, the teams were herded inside and treated to a live-action sketch. The premise was that we had been touring the Large Hadron Collider, but had stumbled into the laboratory for a secret time-travel project (dubbed, appropriately, Quantum Leap -- the "host" character even carried a colorful hand-held computer named Ziggy). 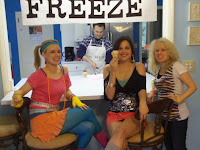 According to the background story, we had traveled back to the 1980's. The entire house was full of 80's paraphernalia, complete with costumed characters who could have jumped straight off the Flashdance DVD (sorry, VHS tape). The participating teams were tasked with solving puzzles that would help us figure out the identity of a Russian gangster/killer/terrorist. The exact details of the storyline were a bit hazy, but rest assured that the plot would have fit perfectly into an episode of MacGyver. With the introduction complete, the team captains were given large envelopes containing three the first three puzzles, each beginning a separate chain. Each solution led to an new envelope containing next puzzle in the chain, a number of victory point tokens, and few puzzle pieces that, when fully assembled, would create a pictogram/rebus leading to the final envelope -- and, presumably, the identity of the villain. The puzzles themselves were enjoyable, all heavily 80's-themed with some requiring a fair amount of 80's pop culture knowledge. Extensive use of the Internet was also invaluable for many of the solutions. 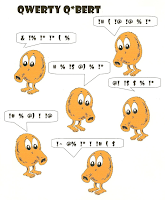 For one early puzzle, teams were required to solve a cryptogram consisting of Q-Bert swear-word characters. The solution led to a metal pyramid at one of the campus buildings, under which the next envelope was hidden. Another puzzle came in the form of an audio CD, from which players had to identify short snippets of 80's songs (fortunately, mostly hits) in order to spell out the location. The answer seemed fairly straightforward: "TOOMER'S COFFEE, FIND WAR AND PEACE, SAY WORD UP". We headed to the coffee shop, only to find that there wasn't a copy of War and Peace on the shop's bookshelf. After scaring most of the patrons by wandering around and randomly yelling "Word Up", my team spotted a young woman reading a book. You can probably guess what it was. After confronting her directly and saying the magic code phrase, we were awarded the next envelope. Other puzzles weren't quite as elegantly designed. One that kept us stumped for over two hours consisted of a Pac-Man maze full of dots, power pellets, and ghosts, along with rules on movement through the maze. We correctly assumed that the dots spelled out morse code characters, but none of the valid paths through the maze made any sense. The spacing was ambiguous, and it was difficult to figure out where the breaks were. After banging our head against the puzzle for hours, we called the party organizer for clarification. Apparently all of the teams were having trouble with this one, and the key was to ignore spacing altogether (which would have been more intuitive if several groups of dots/dashes hadn't been spaced tightly together in valid morse code groups). Another puzzle required identification of stars on a provided star chart. Connecting the correct stars would spell out part of the solution. 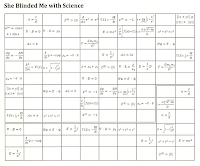 The problem was that the puzzle creator had used a specific computer program to generate the star chart, and it was nearly impossible to match up with any publicly-available resources from the web. It was unfortunate that we ran into snags like this, because both puzzles were extremely interesting in concept but failed somewhat in design. Still, most of the puzzles were quite fun, if occasionally a bit too easy. Unfortunately, due to getting stuck on all three puzzle chains at approximately the same time, my team didn't manage to finish. My small group at "base camp" solved the rebus pictogram with only 10 minutes left before the final deadline. We were carrying the group's victory points (cleverly disguised as Russian currency) that had to be turned in before the deadline, so there was simply no time for us to pick up the final envelope. Even though we didn't quite finish, we had a great time with the event. Everyone contributed to the group effort; from my encyclopedic knowledge of 80's pop music to our team captain identifying braille patterns within seconds of seeing a puzzle, every player was valuable. Most significantly, using Burger King as our base camp was a terrible idea. A sticker on the front door touted free Wi-Fi internet access, but it wasn't working correctly. Despite having three laptops with us, we were forced to tether to my friend's cellphone to get online. When he left to pick up a puzzle piece, we were stranded without web access for nearly an hour. We also didn't have access to power for our electronics -- the restaurant had plenty of outlets, but none of them were turned on. The Burger King was several blocks from the university proper, while most of the puzzle solutions led to campus locations. We could have saved a lot of time by choosing an on-campus headquarters with reliable power and internet access. Also, we spent far too long stuck on specific puzzles when we could have called for clarification much earlier. It was my understanding that we had to spend victory points to receive clues for anything we were stuck on, but it turns out that clarifications were free in some cases. We didn't see an actual copy of the event rules until pretty far into the day, so this could have saved us an hour or two of solving time. Fortunately, both of these problems are easily remedied. If we go back for the next event in the Spring (and we're definitely planning on it! ), I have no doubt that our team will put in an even better performance. I'd like to give a huge "thank you" to everyone responsible for organizing and running the event. 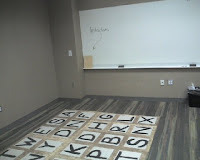 The amount of prep-work involved seemed incredible, from the 20ish unique puzzles and custom-developed website to the human-sized wooden sliding puzzle and free pizza and drinks at the end. It all made for an absolutely amazing Saturday that I will remember for a very long time. I apologize for the lack of posts recently. I'm planning on spinning off the boardgame content into its own blog, but that process probably won't begin for at least a few more weeks. And lots more! No lack of ideas, just a lack of time at the moment. The focus of Monkeys With Typewriters has shifted to boardgames over the past few months, and it's a direction in which I'd like to continue. Still, I'm a gamer in the most general sense, and the news that a new MechWarrior video game is in development -- headed by the original BattleTech creators -- is just too exciting for me to pass up. As most gamers probably know, MechWarrior is heavily based on BattleTech, which was conceived as a tabletop miniatures game but quickly gained popularity through its video game translations. In BattleTech's violent universe, huge robots called "mechs" are the unrivaled war machines of the future. Imagine hundred-ton walking tanks with a dizzying array of weapons, stalking across the battlefield, easily laying waste to anything they encounter -- short of another mech. Rather than rehash the few details we've learned about the upcoming game, I'm going to relate a story. If you you're new to the BattleTech universe, this may inspire you to check out the games -- whether tabletop or computerized. If you're an old mech nerd like me, perhaps your love of the game will be rekindled. Back in the mid-90's, when the Internet was still in its infancy, dozens of mech enthusiasts played on the BattleTech 3056 MUSE. The MUSE was a text-based, real-time online mech combat simulator. It faithfully recreated all of the rules from the tabletop game, translating game rounds into real minutes and seconds, and updating players with ASCII-drawn sensor scans and terrain maps. Players represented a pilot -- a MechWarrior -- each assigned to a unique mech. Entire large-scale wars were fought "in-character" between the different factions in the game, with dozens of mechs taking the field for a single fight. My personal mech on the 3056 MUSE was a heavy assault unit called a BattleMaster. Aside from a healthy mix of short- and medium-range weapons, the thing had insane amounts of armor. My mech, in particular, seemed to be nigh unkillable, lasting through several battles that it really had no right surviving. Despite taking massive internal damage on several occasions and having more than a few arms and legs blown off, nothing could ever quite knock out my BattleMaster's main reactor. My unit was the Eridani Light Horse, a well-known mercenary group consisting of several dozen pilots. I remember our first in-character engagement: a long, running battle through the forests of some godforsaken Draconis Combine planet. What began as a light, company-level skirmish slowly degenerated into a war of attrition as both sides ran low on ammunition. My BattleMaster represented itself well, dishing out punishing shots from its energy weapons even as the ammo supply for its rocket launchers dwindled. I managed to destroy a nearly undamaged enemy Awesome (another Assault Mech with three devastating Particle Projection Cannons), emerging from heavy woods and firing a couple of point-blank volleys into its back. Still, I was taking a lot of hits, most notably from a particularly pesky Griffin. 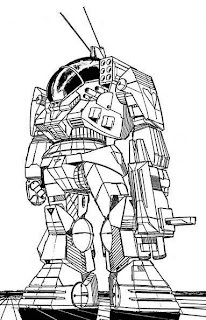 The Griffin is a somewhat smaller medium-class mech, but its lighter armor and firepower is more than compensated for by its incredible mobility; not only could it run circles around an assault mech like mine, but it was fitted with jump jets that would allow it to make huge, fiery leaps over difficult terrain. I'd been trading shots with the Griffin for the better part of ten minutes when my opponent finally got a break. With a blazing volley of firepower, he finished off the internal structure in my BattleMaster's right torso, destroying most of its functional weapons and snapping off the left leg. My mech fell hard to the ground, severely damaging the actuators in the remaining leg. I was prone and immobile -- and facing away from the Griffin. As I lay helplessly on the ground, the damaged but still mobile enemy mech closed in to finish me off. Enlightenment hit me like a lightning bolt: the Griffin was standing in my rear firing arc! I triggered my remaining rear-facing medium laser. Headshot! The Griffin's head, already missing much of its armor from our earlier exchanges, offered little resistance. My beam of coherent light sliced right through the cockpit. The enemy mech slumped to the ground, its pilot dead. My BattleMaster unable to stand, I knew I was out of the fight at that point, but my teammates quickly cleaned up the rest of the enemy unit. We loaded back onto our dropship with millions of credits in salvaged equipment -- including a nearly-intact Griffin, absent one head. And that, in a nutshell, is the essence of BattleTech. Oh, sure, I was playing a primitive text-based game, and this new version of MechWarrior promises to be a beautiful, state-of-the-art simulation. But it's all the same game at its core, whether on a tabletop, an ASCII-based text window, or a fully-rendered 3D world. I'm hopeful that the upcoming MechWarrior game will live up to its BattleTech pedigree and can bring this type of incredible, adrenaline-filled experience to a new generation of gamers -- and to some of us curmudgeonly old ones, too. Christian is in a transitory state, but still appears to be structurally sound.